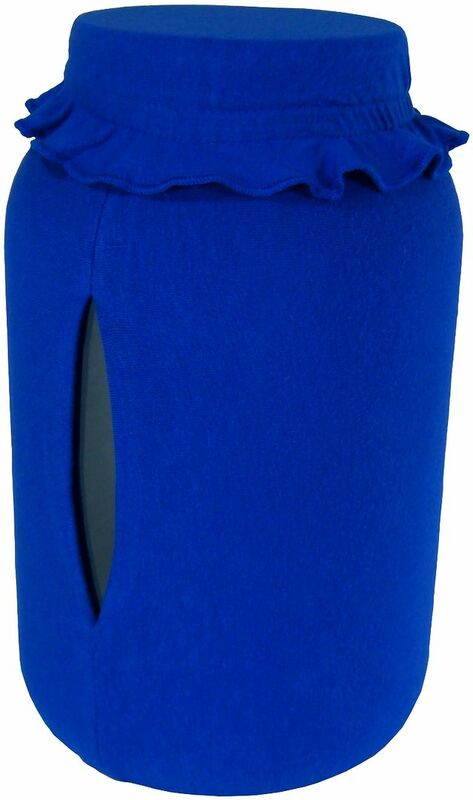 Choose the Heating System you prefer to keep your Kombucha warm all year! Each delivers the same great power, so select based on style and ease of use. From our manually controlled Essential Heat Strip to the dimmer control of the Year Round Heating System to the full thermostat control of the Ferment Friend, all are fully guaranteed and will warm up to a 2.5 gallon brew. For additional info on each model, click the product listing or see more below. 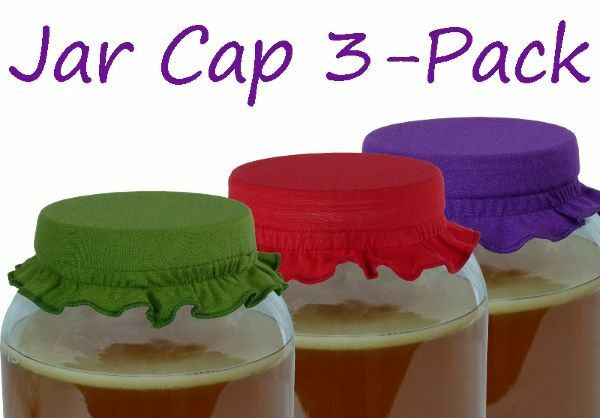 It is a common homebrewers refrain: How can I keep my Kombucha brew warm, especially in Spring, Fall and Winter? Let the brew get too cold and the cycle slows down, reducing the healthy stuff in your brew and even exposing it to a potential mold infestation. Not good! Until now, standard beer heating belts and weakly powered seedling mats were the only choices available. If you're house is cold, they won't help! As a long time brewer, I was frustrated. Even in Southern California, it gets cold at night and in the Winter. Some of my Continuous Brewers are near the back door and can catch a draft. Seedling mats offer very little power and are run through with wires. There had to be a better way. So I went out and found it! 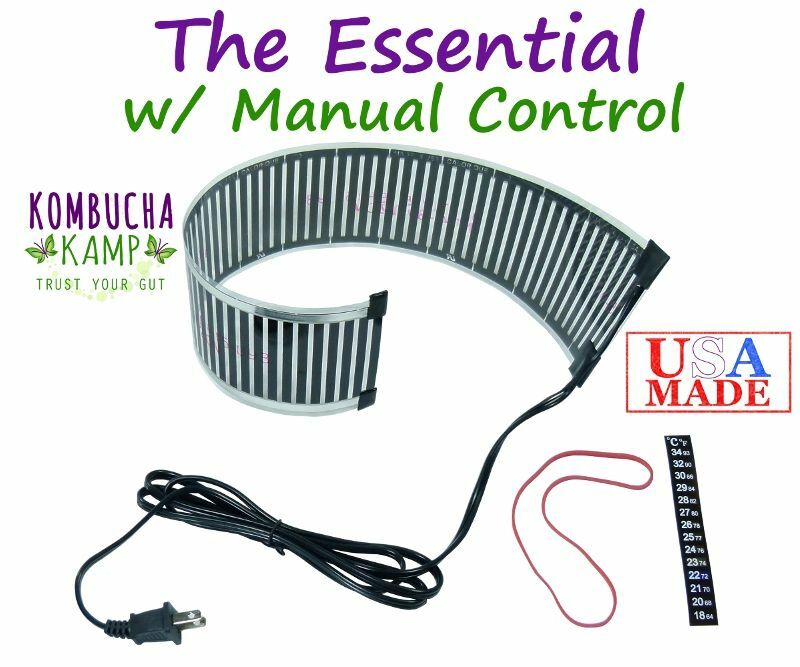 The Kombucha Mamma Heating Systems are designed by Kombucha Kamp with the help of a thermodynamics engineer. Designed for ALL COLD CLIMATES, utilizing brand new technology perfected and patented only recently, these heating systems are not only the perfect size to fit our Continuous Brewers but will keep your brew at the optimum temperature you desire all year long. 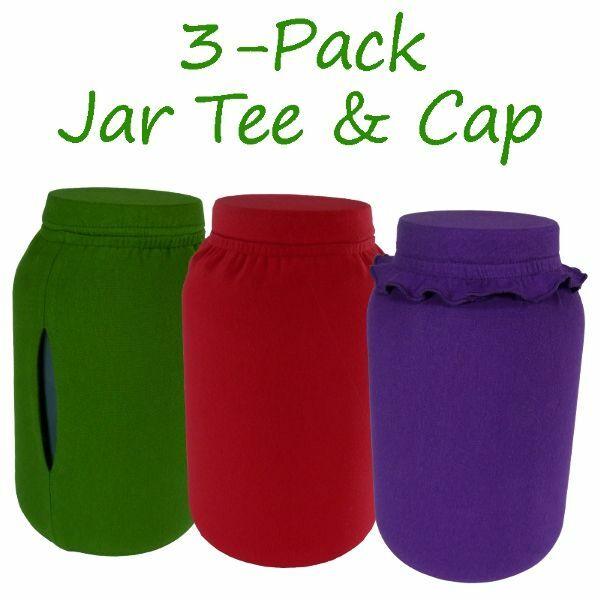 Plus you can use these heating systems with a gallon jar or almost any sized vessel too. No wires so it's perfectly safe with glass! The only heating mats on the market specifically designed for Kombucha, and if preferred even COMPLETE WITH A THERMOSTAT or a DIMMER! 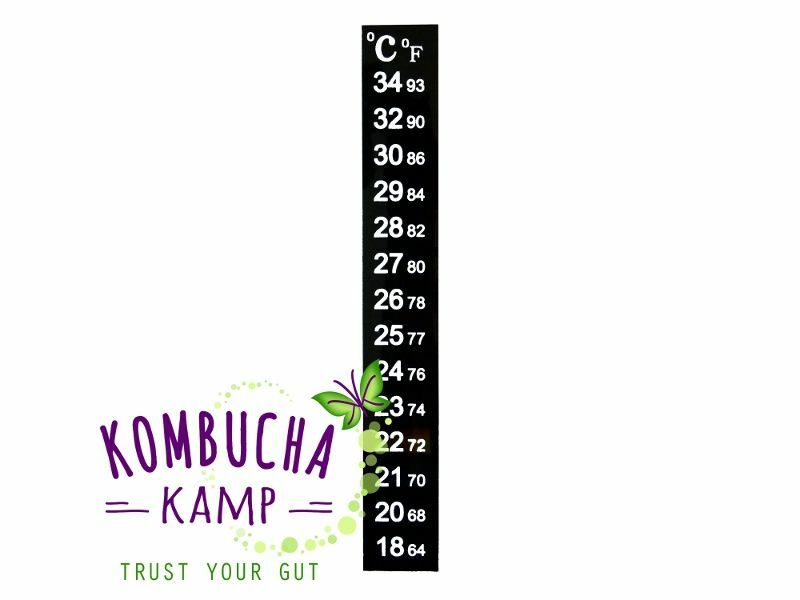 Ultra-thin construction & patented heating technology make for more uniform heat distribution which helps to maintain the ideal temperature for Kombucha fermentation. Finally, you'll be in control of your ferment cycle all year round. How Should I Heat Kombucha? And What is the Best Way To Heat My Kombucha Brew? 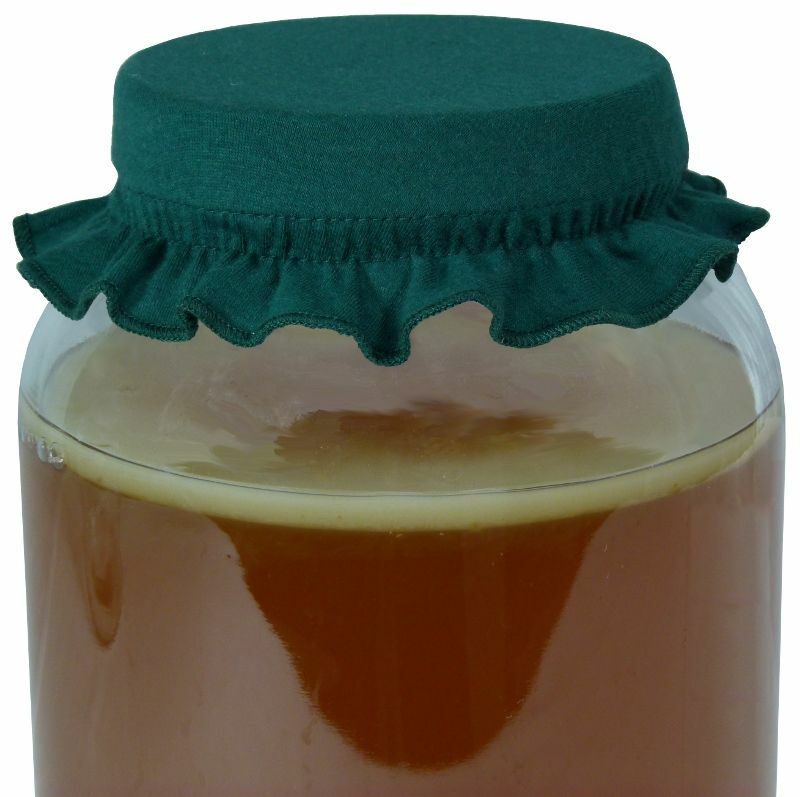 The recommended temperature for Kombucha is 75 - 85 degrees, with the ideal temp being 78. If it brews at lower temperatures, one may experience a flatter, more "dirty" tasting Kombucha that lacks the apple-y sour bite of a delicious, properly brewed Kombucha. Allowing the brew to go for a longer time at lower temperatures (mid to upper 60's) will help it grow more sour and should produce a safe, drinkable beverage over time. Attempting to ferment at lower than 64 degrees may produce a weaker beverage or may be susceptible to mold as the bacteria get "sleepy" and have a difficult time protecting themselves at the low temperature. Finding a warmer spot in the kitchen, wrapping the brew in a towel or blanket or placing next to a working appliance are some ways to increase the temperature. If you find you still need a little heat for the brew to produce the best results, we offer 3 models of custom made Kombucha Mamma Heating Mats. 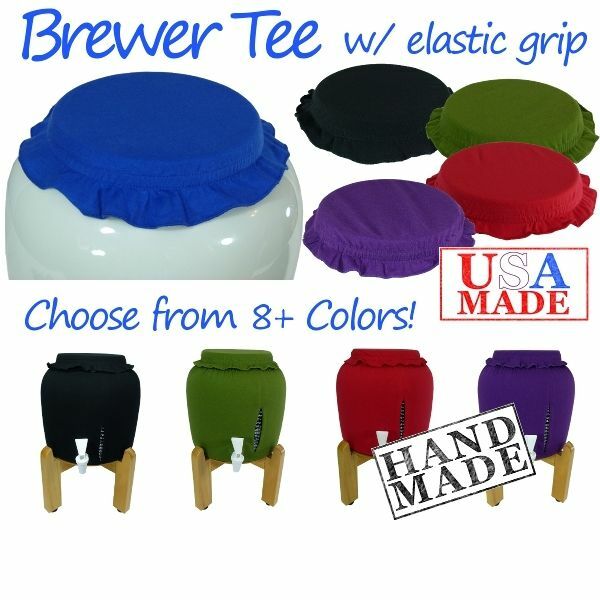 All are specifically designed to heat from the side for optimal use with Kombucha and all are made from extremely efficient, award-winning heating material. Each heater provides the same great power to heat brews up to 2.5 gallons in size, so it's a question of functionality and style as to which unit is best for you. The Essential Heat Strip simply plugs into the wall and you control the amount of power by moving it closer or further from the vessel (an included rubber band holds the heater in place). 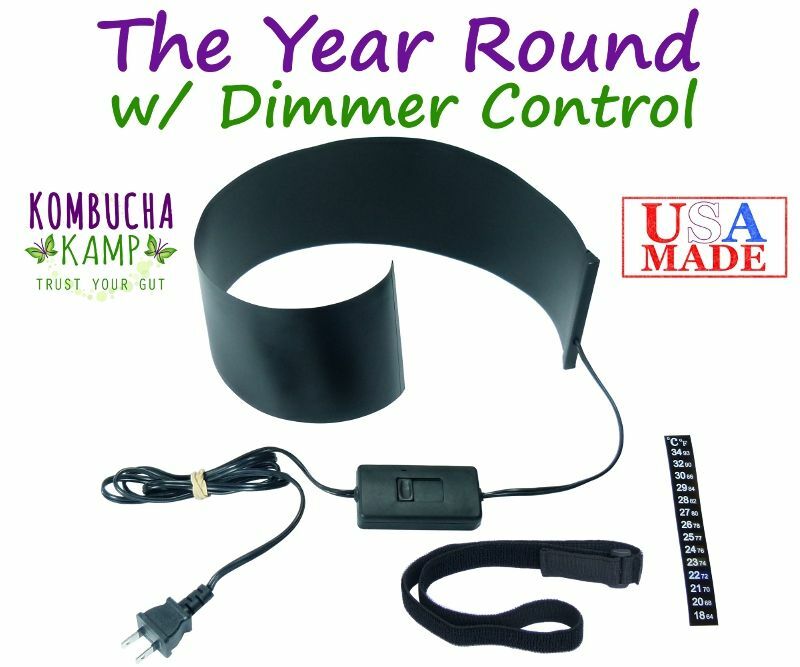 The Year Round Heating System w/ Dimmer offers dimmer control and more efficiency (and style) via a sleek black covering to the heater element, a finely tuned dimmer slider, as well as a proper velcro strap for attaching it directly to any vessel. Finally, The Ferment Friend Heating System w/ Full-Control Thermostat provides the simplest and most accurate option by maintaining the proper temperature without any help from you. It includes the same velcro strap as the Year Round Heating System plus an extra velcro piece for attaching the thermostat to your brewing stand if desired, with the same sleek and efficient black covering to the heating element. The unit is very easy to use, just plug it in, enter the desired temperature on the touch pad, place the probe between the strap and the vessel and it will automatically keep your brew within 1 degree of ideal. Kombucha Mamma Sez... "We use a heater on each of our brews here in Southern California. If the temperature is pretty consistent in your brewing environment, then the Essential Heat Strip or Year Round Heating System are great choices, with the Year Round offering a bit more control and a bit more style. 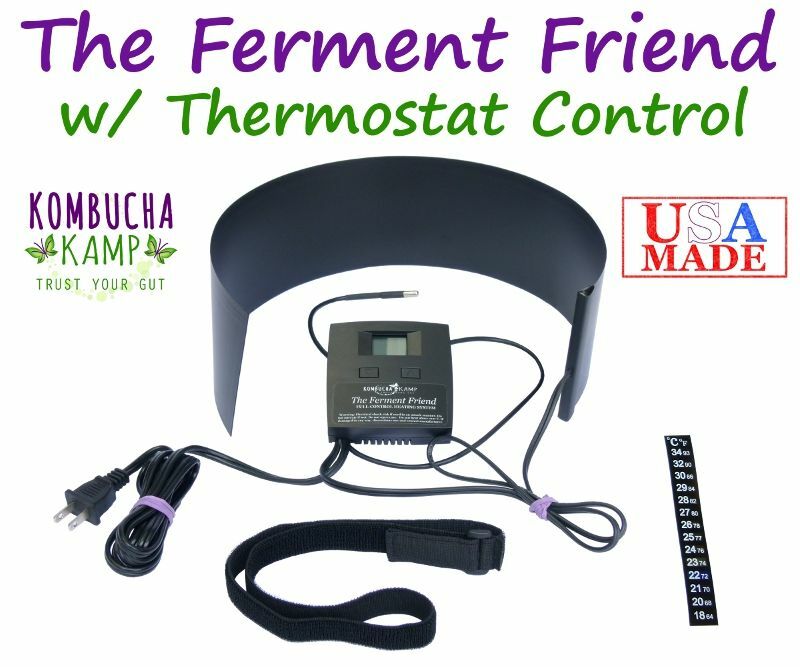 If your temperatures fluctuate a lot or you just want to set your brew and not ever worry about the temperature again, the Ferment Friend with thermostat is the best choice as it offers the most convenience and control." Assembled in USA and all components made in the USA (except power cord) which means your friends and neighbors have a job! This video shows our original versions of the heating mats, as you can see from the product pitctures, we have been through a few evolutions! But this video does still show the basic usage and some tricks. Check out the product listings for current photos. :) MADE IN THE USA! !